Located just off the Queensland coast, in the Great Sandy National Park, this island is a 4WD only territory. You could hop on a barge from Hervey Bay, early in the morning, and even take your own 4WD (recommended only if you’re an experienced driver, the deep sand has stranded many) and head back same evening at sunset. My favorite destination on the island is a crystal clear blue-green lake with pearl white sand that rests in the middle of the island. It is fascinating to know that it was created naturally by collection of rainwater with no streams moving in or out of the lake. It is mesmerising just to walk or sit on the soft sand, simply gazing at the magical colors, and even more relaxing to take a swim. After a sumptuous lunch, we headed towards central station where we walked through the tall rainforests listening to interesting stories about the island. At the end of the boardwalk we stepped down into the creek and floated and walked in the fast flowing water, towards the beach where the creek pours into the ocean. Our bus was waiting for us on the 75-mile beach road to take us on one of the best coastal drives in the world. The surface of the road is tight packed sand below the tide mark. The constantly moving sea and sand varies the length and width of the road often. It’s not without its challenges with loose sand and washouts that you find your tires in, every now and then. Our next stop was at the Maheno Ship Wreck on the beach road. A World War I hospital ship lost in a cyclone that turned up at this coast, which is majestically rusting away in this island. Other places located at farther distances on the island but worth a visit are Lake Wabby, Indian Head and Champagne pool. You would need more than a day to visit these places. You can see wild Dingos in their natural state on this island if you’re lucky, but be aware of their known brutal attacks. It is recommended that children aren’t left by themselves. The island is named K’gari, meaning ‘Paradise’ by the people of the land, and you now know why. 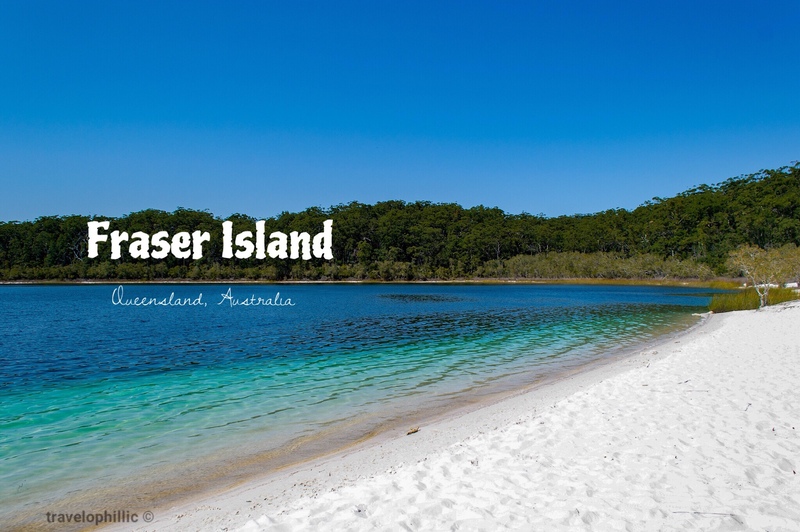 I booked a premium day tour to Fraser island that included the barge fees, pick-up and drop to our hotel, touring on a bus with a max of 18 guests and a lunch with one course meal, cheese platter and wine costing $240 per head. A Helicopter tour of the island was available for an additional $70. Thanks Sudha, glad you liked it!